DiGregorio playing for the Buffalo Braves. Ernest "Ernie" DiGregorio, known as "Ernie D." (born January 15, 1951), is an American former National Basketball Association player. He was the 1973–74 NBA Rookie of the Year and holds the NBA rookie record for assists in a single game with 25. Due to a severe knee injury suffered early in DiGregorio's professional career, he played only five NBA seasons. He was selected third overall by the Buffalo Braves in the 1973 NBA draft out of Providence College, and won the NBA Rookie of the Year Award in 1973–74 after averaging 15.2 points and leading the league in both free throw percentage and assists per game. DiGregorio still holds the NBA rookie record for assists in a single game with 25 (a record now shared with Nate McMillan). He would never again come close to that level of production, but managed to have a decent NBA career, most of which he spent with the Braves. During the 1976–77 season, DiGregorio led the league in free throw percentage a second time, with a then-NBA record 94.5%. In 1977, DiGregorio joined fellow NBA stars Julius Erving, Rick Barry, Wilt Chamberlain, and Pete Maravich, in endorsing Spalding's line of rubber basketballs, with a signature "Ernie D." ball making up part of the collection. 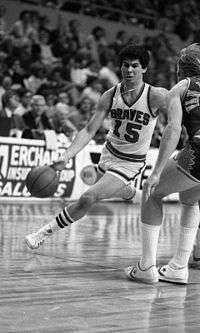 After playing 27 games with the Braves in the 1977–78 season, DiGregorio was traded to the Los Angeles Lakers, but he played in a Lakers uniform in only 25 games before being waived. The Boston Celtics signed him as a free agent but he played only sparingly for the rest of the season. He would not play in the NBA again, although he did not formally retire until 1981. In 1999, he was elected to the National Italian American Sports Hall of Fame. ↑ Rhoden, William C. (March 2, 1996). "Sports of The Times;Ernie D Has Found A New Game". The New York Times. ↑ "NBA.com Coaches:Nate McMillan". Retrieved 2008-11-02. ↑ "HickokSports.com NBA Annual Statistical Leaders: Free Throw Percentage". Retrieved 2008-11-02. ↑ "Spalding Presents Street Ball, with Rick Barry and Dr. J!" advertisements on the back of Marvel and DC comic books, 1977. ↑ "Ernie DiGregorio". National Italian American Sports Hall of Fame website. Retrieved 2010-02-04.